I’ll be down in SJ next week meeting with some clients. Uptime Symposium is going on at the same time and some friends asked if I would come by the booth to say hi and see their latest technology. Sorry I won’t be able to attend the exposition given my work with others companies creates a "perceived conflict of interest” (451 Group’s word) and I am not allowed to register for the expo. 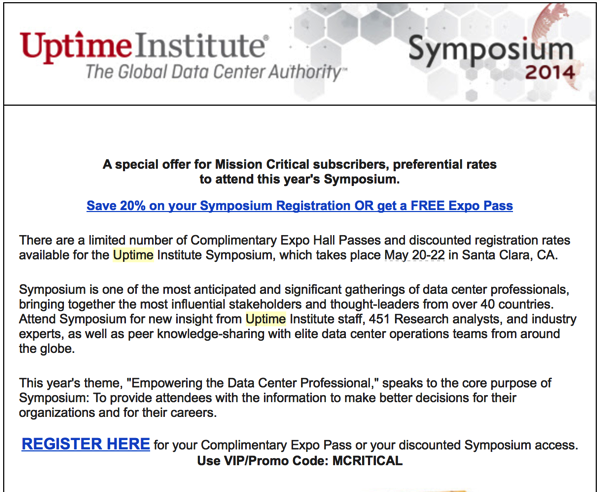 Unless I change who I work with I will not attending any Uptime Symposium events in the future. There is no impact because I can meet my friends away from the booth or see them at 7x24 Exchange in Boca.